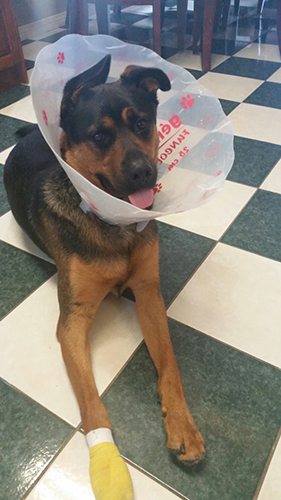 July’s patient of the month is ‘Bronco’ Ayala, he was in recently for a cut on his paw. The cause of the cut is unknown but his owner thinks it may have been crushed glass on the sidewalk. Upon arrival the wound was cleaned and staples were placed to close the wound and allow for optimal healing. He was sent home with some pain relief and antibiotics which helped to keep him comfortable and prevent and treat infection. To keep him from licking the wound he was fitted with a cone and the wound was bandaged with a stylish yellow bandage. Bronco is an almost two year old Shepherd Rottweiler cross. He has one ear that stands upright and one that flops down which gives him a bit of an endearing confused look. He is super happy and friendly and would like nothing more than to play and eat treats all day. Since his visit with us his paw has completely healed and he is finally cone and bandage free.